Maison de la Gare is a non-profit, non-denominational and non-political organization, founded in 2007 by a group of ten young Senegalese men and women driven by a determination to improve the lives of the begging talibé street children of Senegal. The talibés often suffer from psychological problems related to their separation from their parents and family. They desperately need a place where they are listened to, and can reclaim their identities as children. Maison de la Gare provides the talibés with hygiene support and basic health care. Talibé children rarely have the chance to go to school or to play organized sports. 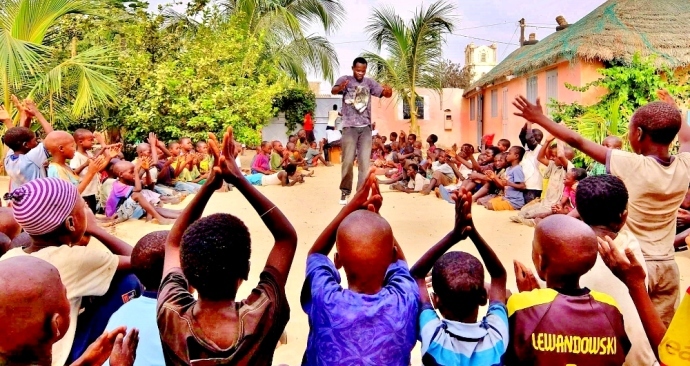 The literacy classes and sports programs offered by Maison de la Gare, along with participation in cultural and artistic activities, give the children a sense of self-worth and help them to not feel inferior to other children. Above all, Maison de la Gare is a local development initiative. The organisation lobbies aggressively for the cause of the talibé children, and works to make this a central issue of political debate both within Senegal and internationally. In support of it's objectives, Maison de la Gare's team works to build and maintain strong collaborative relationships with government authorities, other non-governmental organisations, and in particular with the marabouts who are the key to realizing real change in the system. Maison de la Gare also works with educational authorities to develop an appropriate curriculum for the talibé children which will enable integation with national Senegalese programs.